What value is there in transcribing and viewing an entire probate case file? If it is lengthy, you might be tempted to skip this task, but you’d be making a big mistake. To solve brick wall genealogy problems, we need to examine every possible clue. I’ve been working on a fascinating project for our Research Like a Pro study group and it all hinges on probate. 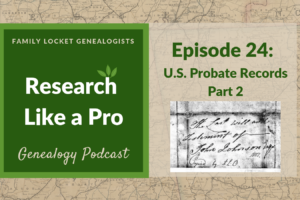 In Part 1 of this series I discussed what might be found in a probate case file and how to locate probate records for your ancestor. 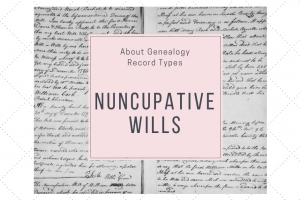 Part 2 of the series delved into the various types of wills and how to use them for your research. This article explores what happens following the decease of the individual. Using the case of Georgia A. (Lewis) Dawson, I’ll show how very small details in the probate can be used as evidence in proving a case of parentage. First, why did I choose Georgia A. (Lewis) Dawson as the research subject for a project? I’ve been working for years to identify the father of my third great grandmother, Cynthia (Dillard) Royston, married to Thomas Beverly Royston. The couple lived in Chambers County, Alabama, from 1850 to 1870 running a large cotton plantation. Some years back, I came across an abstract of the will of Georgia A. Dawson mentioning her nieces, Sarah and Mary Royston. The Royston surname immediately piqued my interest. Could these be daughters of Cynthia? Was Georgia her sister or another relative? Could this be the key to my research? I decided to focus on identifying Georgia A. Dawson to finally solve this mystery. My research objective was simple. The objective of this research project is to identify Georgia Ann (Lewis) Dawson, died 1856 Russell County, Alabama. Georgia married John W. Dawson 6 February 1850 in Russell County. Following the Research Like a Pro process, I analyzed the two known records – Georgia A. Dawson’s will and her 1850 marriage record. I referenced my Russell County, Alabama locality guide, then I created a research plan to fulfill my objective of identifying Georgia A. Dawson. 1. Transcribe the will and probate documents to obtain the names of all family connections and witnesses. 2. Locate Georgia A Dawson on the 1850 and 1860 census with children and possible spouse, in Russell County, Alabama and neighboring counties. 3. Search the 1850 and 1860 census for possible Lewis connections. 4. Search marriage records of Russell County, Alabama for possible marriages of children and references to parents. 5. Search land records for Russell County, Alabama for any land deeds to possible children of Georgia A Dawson. I started with transcribing the entire case file, viewable at FamilySearch. (1) This might seem tedious, but I assure you it is worth it. Georgia Dawson’s will could be the most unique I’ve yet encountered. After discussing her estate and relatives, she gives directions on her burial. I here by authorise [sic] him [executor O.L. Lewis] to use enough of the interest, that may be in his hands, after all my debts are paid, to buy three marble slabs to be placed over the graves of my mother, step-mother and myself. First removing the remains of my step mother and my two children from their present burial place. To where my own mother is buried, and in one grave, place my self and two children with a marble slab over us. Without transcribing the entire will, I would have missed the reference to the two recently deceased children, mother, and grandmother. I haven’t yet located the cemetery, but I’m interested to see if Georgia’s wishes were followed. Georgia Dawson’s estate file consisted of multiple documents, generally in order by date. Notice that most of the documents occurred within eight months of the will, with the final settlement coming three years later. After transcribing the will, I noticed that most of the documents had to do with her property. An inventory was taken and an estate sale held. One of the probate documents noted that the estate sale was to be at the home of Noland R. Lewis. The will had stated O.L. Lewis as a brother, who was Noland R. Lewis? I searched the 1850 census for Noland R. Lewis. He shows up in Russell County, Alabama, and guess who is in the household? Three sisters that Georgia had named in her will: Sarah, Mary, and Savannah. Combined with the mention of Noland R. Lewis in the probate documents, I was able to prove that Georgia belonged in this family. Further research discovered marriage records for Georgia’s sisters. Because they were listed with married names in the will, the marriage records further cemented the evidence. The marriage search also revealed a Mildred Lewis married to a G.D. Royster in 1849. Here was the name I was looking for. Mildred (Lewis) Royster was the mother of Sarah and Mary Royston mentioned as nieces in Georgia’s will. I had solved the mystery about the Royston girls! They were not the daughters of my Cynthia (Dillard) Royston and Georgia Ann (Lewis) Dawson was no relation to my family. Now I could put that possible connection to rest and continue my search for Cynthia’s father through different avenues. Examining the entire probate case file helped to identify the family of Georgia Ann (Lewis) Dawson. As you’re researching your family, you might find similar clues in the documents following the will. Also, be sure to view probate for other individuals of the same surname in the area. Your family member might be identified as an uncle, cousin, nephew, or niece. Researching additional probate for the Lewis family of Russell County, Alabama, I viewed the will of Pearce L. Lewis dated 1852. (2) He mentioned his uncle Nolen R. Lewis and his cousins Jacob G. Lewis and Olven [sic] L. Lewis. These would be Georgia’s father and brothers. J.G. Lewis and O.L. Lewis purchased several items in the estate sale of Georgia A. (Lewis) Dawson. She identified O.L. Lewis as her brother in her will, so here is further evidence of the family relationships. Jacob G. Lewis is not mentioned elsewhere in the records connected to Georgia. Without searching all the Lewis probate, I would have missed this key relationship. 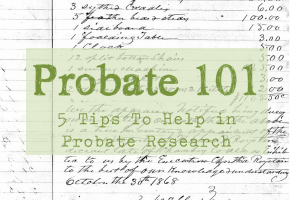 Probate records are the treasure trove of genealogy research. Don’t stop at the will. Taking the time to view and transcribe each document could yield huge dividends. -Petition to administer – Following the deceased of an individual, the executor or executrix files a petition or application to begin administering the estate. -Inventory and appraisal of the estate. -Sale of personal and real estate. -Debts paid to creditors by the executor. An excellent source to learn more details about probate is Val D. Greenwood’s book The Researcher’s Guide to American Genealogy. The 4th edition is now available and I highly recommend having this book on your shelf. His chapters on probate give you details on every term and document you might encounter as you work your way through a probate case file. (1) Russell County, Estate Case File, Georgia A. Dawson, 1861-1864, Folder 1 Box D; “Index and Probate Estate Case files, 1826-1915, arranged alphabetically, > Probate Estate Case Files, Davis, Edward L. – Doles, Arah, 1826-1915, FamilySearch https://www.familysearch.org : accessed 27 May 2018); FHL microfilm 2,203,643. (2) “Alabama, Wills and Probate Records, 1753-1999,” Russell, Will Records, Vol 2, 1850-1873, pp. 39-41; will for Pearce A Lewis, 1852, image 183; Ancestry (https://ancestry.com : accessed 25 May 2018). Thanks, Kaye! Probate records have held the answers to a lot of my projects lately. It’s always exciting to be transcribing and all of a sudden find the right names.